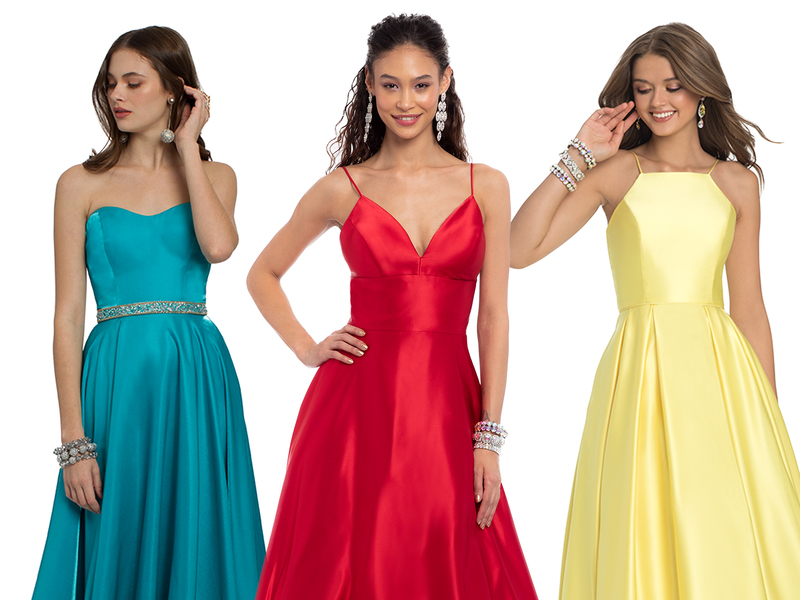 CLV > Blog > Which Color Prom Dress Will You Wear? Looking to be a bit…daring? Instead of traditional royal, brighten up your entrance with any of these turquoise or aqua prom dresses! Strike a pose in an ethereal ballgown or curve-hugging column silhouette. 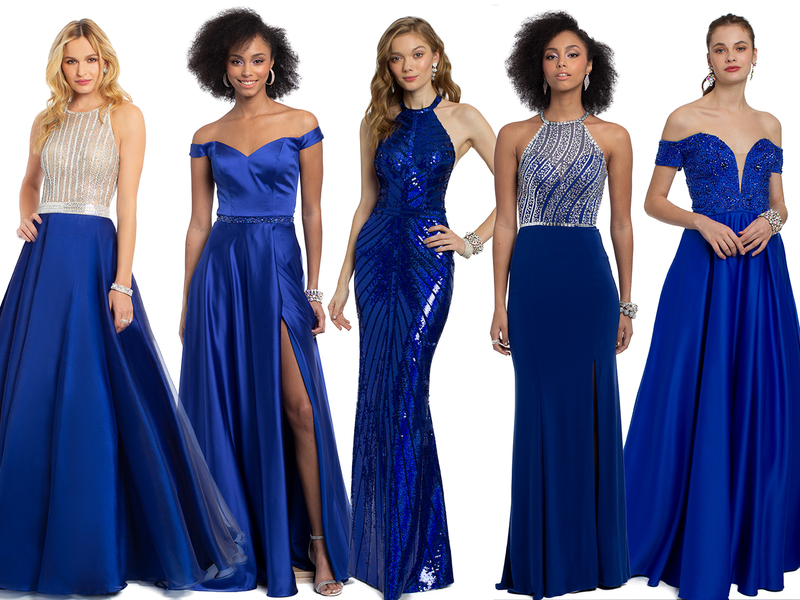 For a more classic look, opt for a royal blue prom dress! The deeper hue makes for a regal appearance, especially when adorned with sparkling embellishments or a shiny satin finish. Queen, much? Shine long after the night’s over in a gorgeous gold prom dress! From full skirts to striking shine, nothing says “YAS Queen!” like one of these Oscars-worthy stunners. Pair with chandelier earrings to complete the luxe look. Who says red isn’t for Spring? 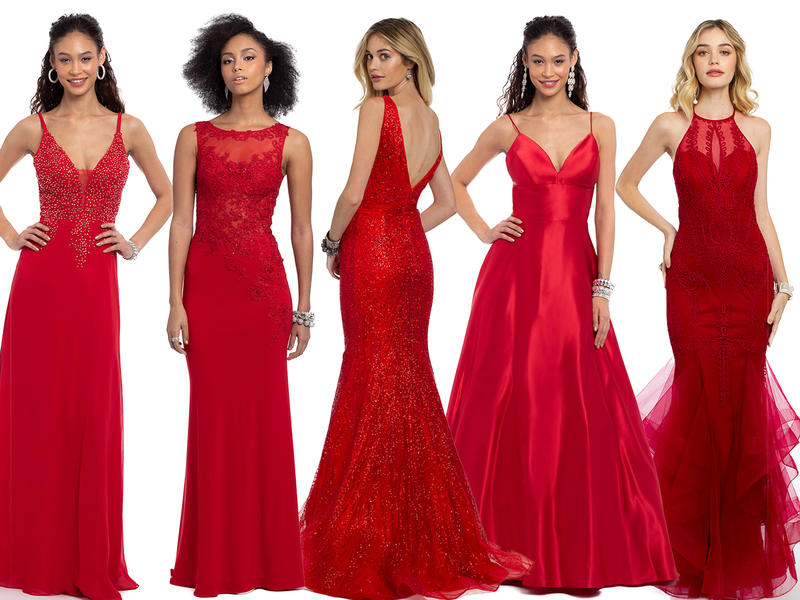 Burn baby, burn in a sizzling red prom dress that commands the spotlight; for a trendy approach, try a satin or glitter silhouette, or stick to a timeless Jersey style with hints of illusion. Pretty in PINK is right! Greet Springtime with a blush prom dress with the prettiest of details; textured brocade, elegant ruffles, and glitter galore give these styles a picture-perfect presence. Finish them off with a tousled up-do for the ultimate romantic effect. The perfect ode to Spring, mellow out in a soft yellow prom dress! From rich satin to form-fitting jersey to breezy chiffon, play with a variety of textures to achieve your dream formal look. Another daring choice, a purple prom dress in bold lilac is the definition of Spring. Pare down the bright shade by opting for a sleek off the shoulder silhouette, or crank up the drama with a full tiered or tulle skirt. Either way, these fashion-forward styles deliver.